After 13 years, the Basekamp group is moving out of our Philadelphia Chestnut Street space – as of August 2011. We still like overnight guests, but now you get to sleep on our couches! 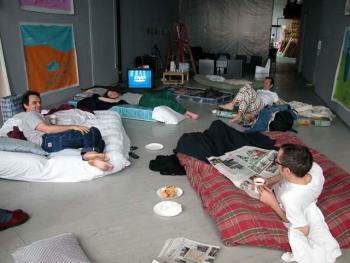 Artists interested in sleeping-over should inquire in advance. We plan to also meet in person, now at various locations. Let us know if you’d like to join us. Sign up here to receive info about each week’s invited guest, and join the discussion list that accompanies these weekly chats. Basekamp is located in Philadelphia, Chicago, Hartford, and Paris.